I've had Cookie A's long-awaited book for a couple of weeks now and have had a chance to go through it. It's called Sock Innovation, and it's a doozy. Here is a picture of the cover. This is a manual of sock design at a pretty sophisticated level. Cookie explains in detail how to adapt flat-knit patterns for socks, how to alter patterns so they fit into the sock schematic, how to divide the pattern for the instep (design) and foot (plain knit), and includes a somewhat intimidating section on charting sock patterns. Along the way she gives clear instructions for several basic sock heels and toes. I especially like her description of the afterthought heel, and I plan to try it sometime. I also like that she shares my biases toward the top down sock and solid-colored sock yarn. Cookie's sock ideas arise out of mathematics. If you think about it, all knitting has a large mathematical component. This is a source of satisfaction to someone like me who has a strong math-aversion. It suggests that I'm not as mathematically inept as I think. But Cookie is mathematically gifted. That she is a sock engineer is apparent in the way she presents her design ideas and in her designs themselves. 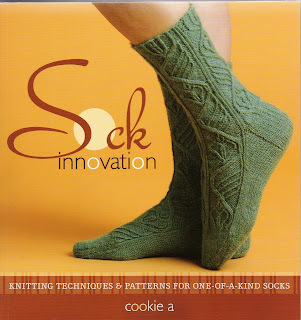 The book contains 15 of Cookie's innovative sock designs, some of which are beautiful and a few of which look overly complex - overly engineered. That is a cavil. All in all this is one of the most valuable sock books I have seen. In no way does this endorsement of Cookie A. indicate an abandonment of my beloved Charlene Schurch. On the contrary, Cookie's book affirms the value of Sensational Knitted Socks and More Sensational Knitted Socks. In a way, you can see Schurch's works as a simplified schematic of Cookie's ideas. Schurch has digested all the sophisticated engineering that Cookie provides and simplifies it into a series of charts and tables. Here is a page from Schurch as an example. 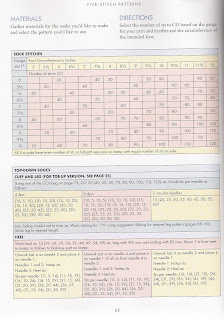 It's not readable here, but the chart at the top shows the number of stitches you would need at gauges running from 5 to 10 stitches per inch to get the sock circumference you need based on specific pattern repeats. Schurch limits herself to pattern repeats ranging from four to 12 stitches wide. She only presents patterns that have an even number of repeats so that dividing for foot and instep is easy. Cookie takes you beyond this basic step. By getting familiar with Schurch's schemes I have been able to venture into simple sock design, so far limited to patterns from directories. But I have gained the confidence to adapt and manipulate patterns. Schurch has taught me the basics of sock design and lead me toward pattern innovation. I am unlikely to design or even knit a sock as complex as some of Cookie's designs, but I have a greater understanding and appreciation for what she does thanks to Charlene Schurch. Another book is worth mentioning in the context of sock design. 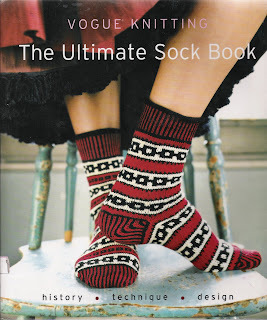 That is Vogue Knitting The Ultimate Sock Book. This is a very easy to follow exposition of sock knitting basics venturing into design. It would be a perfect beginner sock book. It gives you a universal toe up and top down sock pattern to size and embellish as you wish. What I like best about it is the stitch directory, as a supplement to the stitches offered by in Schurch's books. It also offers an overview of historic and ethnic sock knitting traditions, and a selection of patterns, some of which are very pretty.